You might think it’s VeganMoFo month but more importantly, it’s Bad Headline month. And this might be my worst one yet! However, if you eat at Craig’s, or even look at these photos, I think you will understand the lust part. 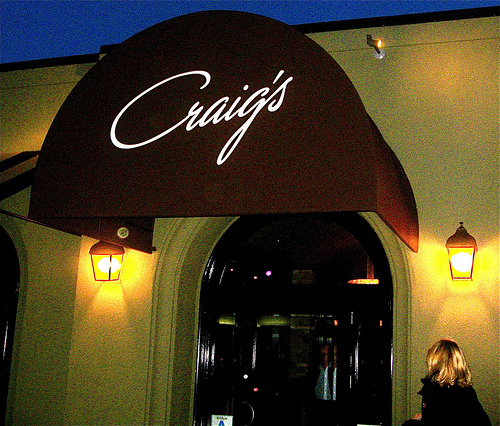 Craig’s is a high-end restaurant in Los Angeles owned by Craig Susser, who used to be a GM at nearby Dan Tana’s. 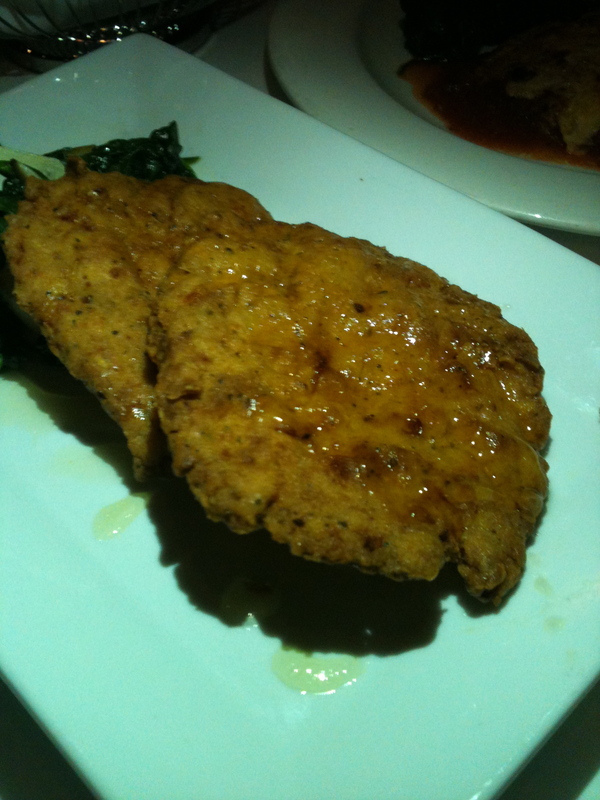 And like Dan Tana’s it features steaks and Italian food and serves them to a similar crowd. 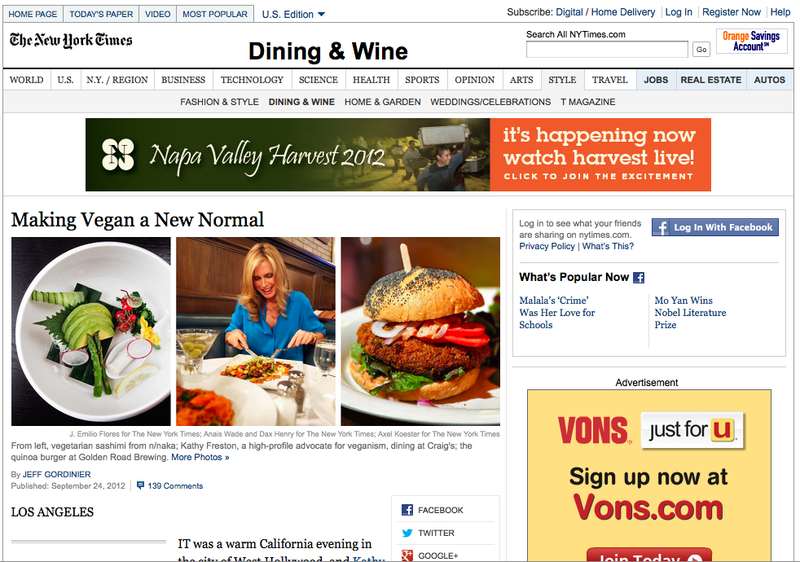 However, Craig’s now has a vegan section on its menu! How did I learn about this development in the L.A. restaurant world? From The New York Times of course. In an article I’ve already written about. So the head of Supervegan’s L.A. office and I decided we needed to investigate. The first things I noticed when we entered is that Craig’s is a hoppin’, even on a Tuesday night. A wide mix of people, not unlike the Dan Tana’s crowd. We were seated in a great booth and quickly got to work on our investigation. Following some questioning of our very helpful server, including the important info that the vegan version of their “Meldman’s Honey Truffle Chicken” is made with agave not honey, we decided to do what we usually do and order way too much food. Which we then ate almost all of. What did we get? We have photographs! Craig’s has a Vegan Pizza on the menu as well as a Vegan Sausage Pizza. 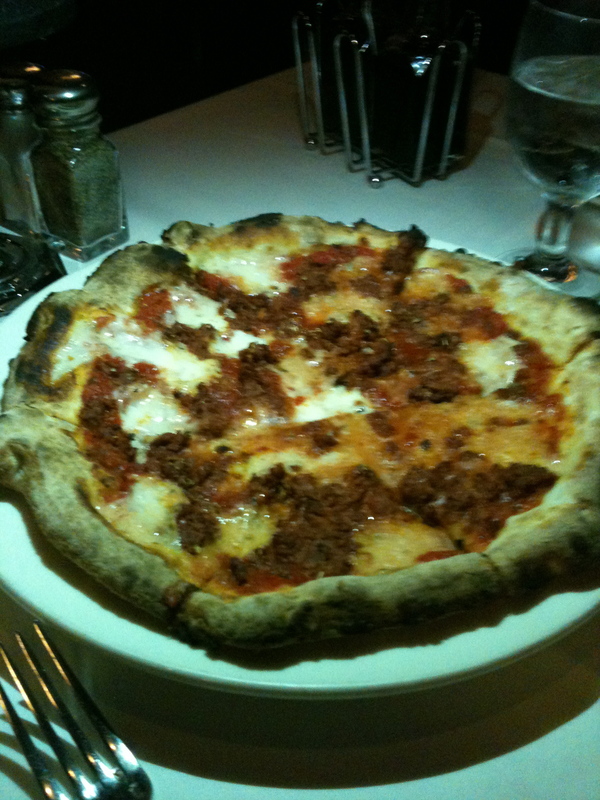 Well, the Vegan Sausage Pizza has an extra word in its name so we got that one. Good choice, us! This pizza was really good, but it clearly didn’t have Daiya. It had a melty, reflective cheesy-looking cheese. Hmm, what was it? Can you believe this, one of the servers knew without even needing to go check: “Oh, it’s Follow Your Heart,” he said. Like I mentioned above, even though the Vegan Meldman’s Honey Truffle Chicken says it’s “tossed with truffle-infused honey,” our server assured us that for the vegan version they use agave instead of honey, so we got it. And it was good. Two big pieces of Gardein that looked like they had been pounded flat and then battered and fried. It was crispy and tasty. Winner! 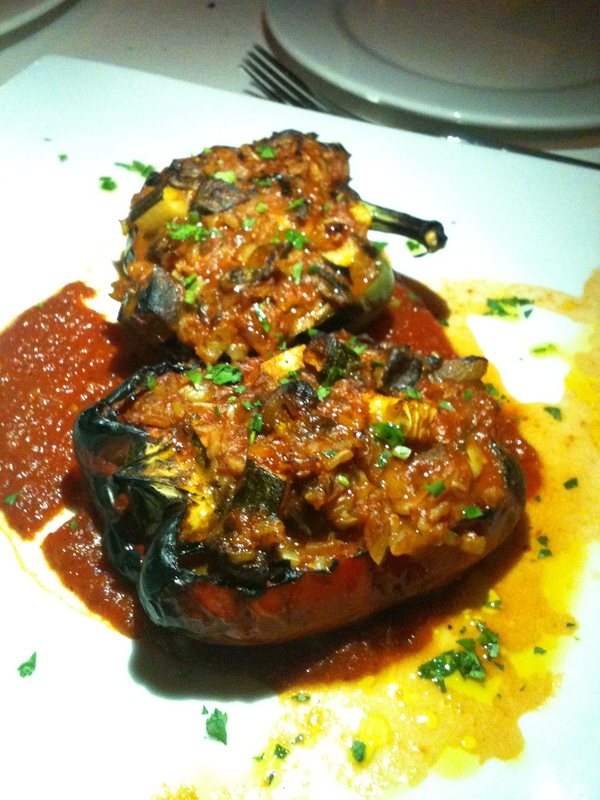 We also got the stuffed peppers and I liked this a lot. One red half and one green half, stuffed with stuff. What kind of stuff? Good stuff. Maybe the picture will help. I thought there were some tofu cubes in there but I could be wrong. I often am. But it was really tasty. 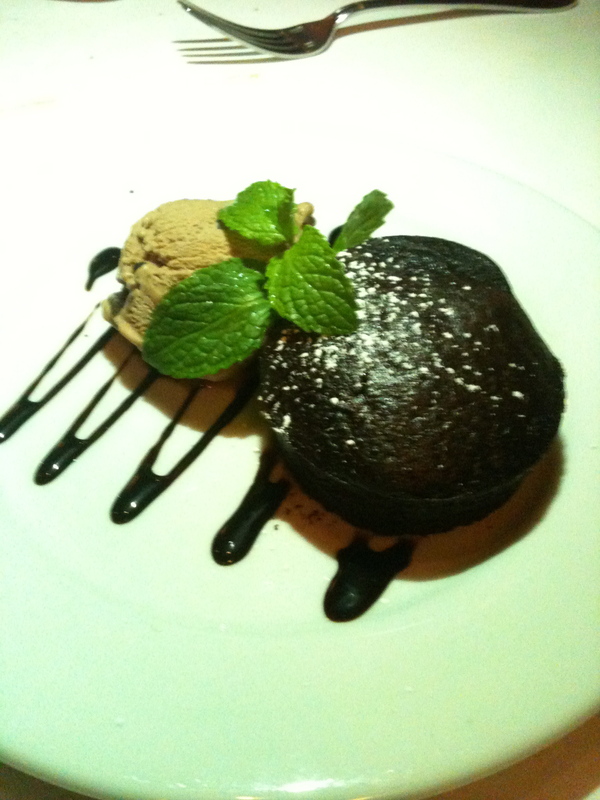 I could eat this again. Now. Even though I’m not the least bit hungry. 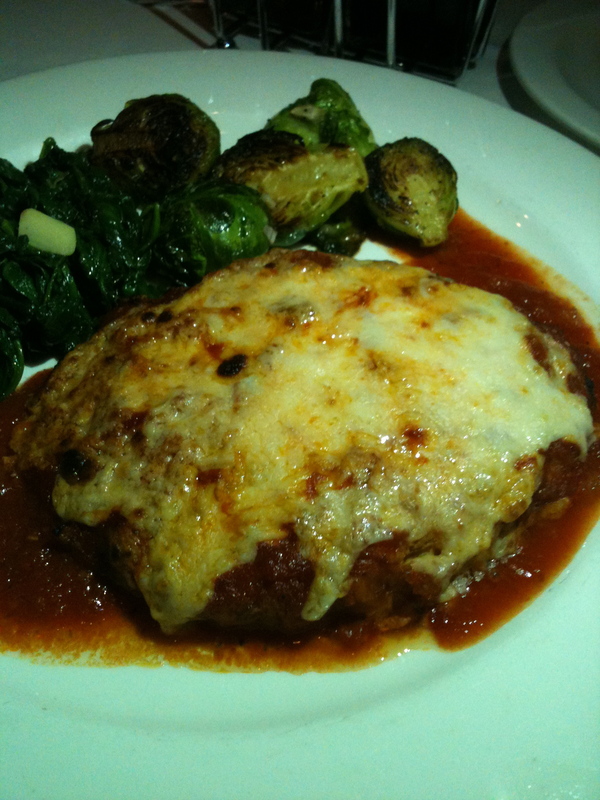 And you didn’t think we were going to pass up the Vegan Chicken Parmigiana, did you? Another big round Gardein patty that looked like it had been pounded flat. We didn’t ask if this was also Follow Your Heart cheese but I’m guessing it was. This dish was also very good and my only criticism would be that the Gardein patty was almost a bit too tender considering that my memory of real chicken parmigiana is that it had a thicker texture. But hey, small complaint. And as we ate all this great food, I was sitting there thinking: we are in a nice restaurant, having dinner like adults, and this feast we are consuming is vegan. If you’re vegan, I don’t have to tell you how rare that opportunity is. It is great to see Craig going out of his way to make you feel like the kind of food you eat is just as valid and normal as the kind of food that anybody else eats. That there is nothing weird about it and that there is nothing unwelcoming about having you come there to eat it. He and his staff were as gracious as could be. Okay, time for dessert. We got the vegan chocolate cake and we were offered the choice of three vegan ice creams to go with it: mint chip, vanilla or coffee crunch. Now I don’t like coffee but THOSVLAO does, so I said let’s go for it and I made the right choice! It was not too coffee-ee and it was delicious, with some kind of toffee in there providing said crunch. However… I did not like the cake. It wasn’t a slice of cake like the menu made me think it would be, but more like a little Pillsbury biscuit of chocolateyness. Oh well, the ice cream was good! So that’s it — two humans, four dishes, one dessert, and four pounds. Worth it!